The Child's Pose with a Twist allows you to experience the massage of your internal organs, including the opening of your side-body to stimulate your heart and lungs. It is a pose that is exclusive to Yin Yoga. I hope you find it to be a very therapeutic pose, as I do! If you are unfamiliar with the Child's Pose, you may first wish to review my page on the pose, by clicking here. The Child's Pose is a wonderful pose of repose and restoration. Adding the twist to the pose changes its therapeutic value and can be done in a sequence with the regular, Wide-Knee Child's Pose. In fact I recommend the following sequence: do the Wide-Knee Child's Pose for 3-5 minutes, followed by the Child's Pose with a Twist, to the right for 3-5 minutes (directions below), then back to the neutral position, in the wide-knee for a brief minute, repeating the Child's Pose with a Twist to the left for 3-5 minutes, then completing the series with a return to the neutral Child's Pose for as long as your heart desires. The length of time you chose to stay in each of the poses in the sequence will depend on your intent for that day. For more information about the purpose of long-held yin yoga poses, please click here. Come into the Wide-Knee Child's Pose. Then twist your torso, while reaching with your right arm, toward the left side, as you lower your right shoulder to the ground. 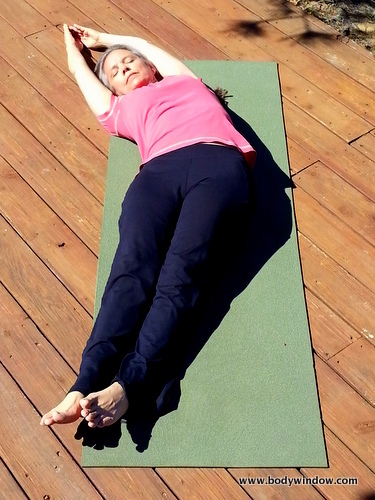 Extend your right arm to be parallel to the front of your mat or blanket. Nestle into your right shoulder. Then take your left arm, raise it up behind your back, rolling your shoulder back, letting the arm come around to lie on your back with your palm facing up. If you have more room for the twist, take your left hand and reach for your right thigh, curling your fingers under your thigh, if you are able. Hold the pose for 3-5 minutes. Repeat on the other side. Remember with all poses that are yin-based, our goal is not to strive to go as far as we can right away, but come to your first appropriate edge. Then release all your muscles as the weight of your body aids the process of sinking into the pose. As you release your muscles, you will find your hips sinking deeper, your shoulder opening and relaxing, and the twist deepening. Resist the urge to fidget as you hold the pose, staying mindful of the slow opening of your body. Try not to judge your body's capability but stay connected to where you body lands in the pose, and include all aspects of the experience - including the discomfort! This long held pose, will work deeper into your joints, tendons, ligaments and fascia, to increase your joint mobility, the fluid within the joint capsules and help you age more gracefully! 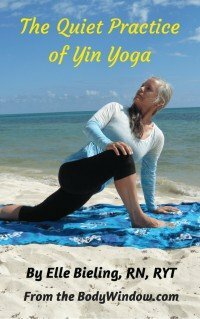 You may find, as you hold this pose, breathing energy into your joints where they feel stuck through belly breathing, that they open a little more. This is a wonderful process, so feel free to shift your torso a little deeper to go to your next appropriate edge. Playing with your edges is so important, as well as conscious breathing. Really stay mindful of relaxing every single muscle, to allow the deeper work into the joints. Inhale as you slowly unwind from the pose, and come back up with your torso. You will feel really stiff and old when you first come out of this Child's Pose with a Twist, but I promise you, your joints will feel so much better after a few minutes have passed. My yoga students never cease to comment on how much better their bodies feel after a Yin Yoga session! Don't forget to repeat the pose on the other side to stay balanced! Finally, the Wide-Knee Child's Pose with a Twist, opens and stretches the side body, which opens and energizes your third and fourth chakras. This is beneficial to you to help you kindle your internal fire and open your heart for giving and receiving love and compassion. By opening your side body, you also open the tiny muscles of your ribs, to expand your chest and it's lung capacity for better breathing. If you have any respiratory condition, like asthma, this is an extremely therapeutic pose. And finally the twists massage the inner organs, squeezing out the old blood, allowing the refresh of the new when you come out of the twist. This improves your circulation and keeps you young. May you enjoy your adding the Child's Pose with a Twist to your Yin Yoga practice! May you always learn to connect to your body and include it in all your life's experiences!